Just Kids – She was full of references. He was full of light and shadow. Recall that tickling sensation when closing your mouth around a particularly delicate piece of chocolate, that bursting joy you feel when its inside is just as good as its cover. Now this is how I felt devouring Just Kids every night. Just Kids is an extremely well written book; perfectly mastering the Arts of unfolding the story of two buoyant kids yearning to become artists and finding their way. This is done in an inspiring and truly honest way, which makes this book a rare and refreshing contribution to the bulk of star-literature. 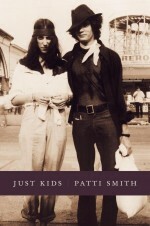 Patti Smith unfolds her artistic capabilities in this book and it is a pure joy to read this book. It is the story of Patti Smith and Robert Mappelthorpe, how they found each other when they were just kids and hopelessly entangled in the drawing universe of New York, the stardust of Andy Warhol and his factory and at the same time the disillusion of growing up in the era of technological dawn. Yet you could feel a vibration in the air, a sense of hastening. It had started with the moon, inaccessible poem that it was. Now men had walked upon it, rubber treads on a pearl of the gods. Perhaps it was an awareness of time passing, the last summer of the decade. Sometimes I just wanted to raise my hands and stop. But stop what? Maybe just growing up. The reader is taken by the hand and wanders the lines of her early life – we are taken to the loft, the Chelsea Hotel, their other loft, Robert’s sexuality and her development as an artist and songwriter. In an inevitable high pace and with disarming honesty, she writes a book truly authentic, almost growing wings. Every single page is filled to the brim with beautiful words, sincerely felt love and references. Reading them came close to slowly melting a piece of Pierre Marcolini chocolate on your tongue – each sentence fits perfectly in your mouth, strikes the delicate balance between light and dark and encompassed that energy and intensity which holds you from eating everything at once. Addictive, highly inspiring and pure pleasure. Once you go there, you never you back.